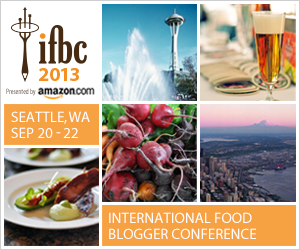 It’s almost here; IFBC 2013 is this week and I, for one, am giddy to attend. When we last convened about IFBC, final details were in flux. That is no longer the case. The attendees have been finalized, the agenda is set, and the afterparties are awaiting. What’s left from now until then? Order new business cards. Get a haircut (I should look presentable for this, after all. Which reminds me; do laundry) Stretch out my stomach for all the eating by eating. Raise my tolerance for the volume of booze flowing. Reserve transportation to get to the events. Figure which sessions to attend. This should be fun. Look forward to meeting my fellow food bloggers. Cheers to that. UPDATE – The folks at IFBC have released a conference app. Whee to new media!